Have you been in need of a practical and pleasant way to teach kids how to write an adventure story? This mini guide for teachers and parents is the answer to your need. 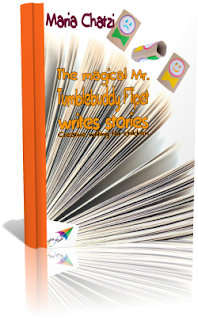 The magical Mr. Tumblebuddy Flipet is a teaching prop, a simple and effective tool to be used by the educator and the parent. Through tumbling and flipping, he guides kids to write an adventure story with a series of plot twists. He reveals all his story-planning and story-writing secrets and becomes children’s guide and buddy, who trains them in the magic of creative thinking and creative writing, helps them express themselves, frees and cultivates their imagination. This ebook presents Mr. Tumblebuddy Flipet and gives you step-by-step instructions to create him, as well as detailed explanations on how to use him. I have also added notes, tips and ideas for additional activities. This book has been flying on the Internet since October 2013.